Synthetic peptide within Human LXR alpha aa 50-150 (Cysteine residue). The exact sequence is proprietary. Human fetal liver, Jurkat and MCF-7 cell lysates. Jurkat cells and MCF7 cells. Our Abpromise guarantee covers the use of ab176323 in the following tested applications. WB 1/1000 - 1/5000. Predicted molecular weight: 50 kDa.Can be blocked with LXR alpha peptide (ab191835). 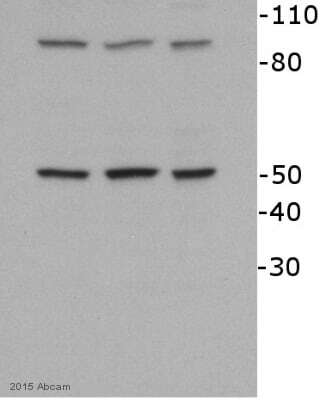 Western blot - Anti-LXR alpha antibody [EPR6508(N)] (ab176323)Image is courtesy of an anonymous AbReview. Lysates/proteins at 23 µg per lane. From left to right lanes 1 - 3. Blocking was done with 5% milk in PBS incubated for 1 hour at 22°C. Immunofluorescent staining of Jurkat cells labeling LRX alpha using ab176323 at a 1/50 dilution. Flow cytometric analysis of permeabilized MCF-7 cells labeling LXR alpha using ab176323 at a 1/10 dilution (red) or a rabbit IgG control (green). Publishing research using ab176323? Please let us know so that we can cite the reference in this datasheet.